Whew! Are we really almost done with the month? FINALLY?! August always seems like an agonizingly long month for me. “Way too busy” and “too hot and humid to move” tend to collide in August, and I have a personal emotional investment in breaking through to September. The month drags on forever. Maybe that contributes to my feeling that I’ve done a lot of work and nothing at all this month. The truth is more that I have done a lot of work, but not all of it has been the kind I can show a finished result from. I’ve made minor tweaks to things like outgoing links on this blog, but haven’t had the time I’d like to write full posts. I also write a couple of gaming-related blogs that have been suffering from this posting drought, as well. I’ve learned that I can’t draw with a pen for very long at a time anymore. I’ve made changes to my crochet hooks and how I hold them so that I can continue to crochet in spite of my arthritis. As I’ve been adjusting my mindset to living with arthritis (as opposed to believing the doctor can “fix whatever is wrong with me”) I’ve also been trying to change the way I look at my work. I’ll get an idea for something and think, “Oh! I should draw this!” Then I start to ask myself what it would take for me to crochet it instead. Mostly, though, I’ve found I have a real passion for hats. I think there’s a perfect hat for each head, but I can’t seem to find mine. I’ll just keep making them until I figure it out. I hope to match a lot of other people up with their perfect hat along the way! My hat obsession is even mentioned on the Craftypodes “about” page. I finished a very special request in time for my neice’s birthday. 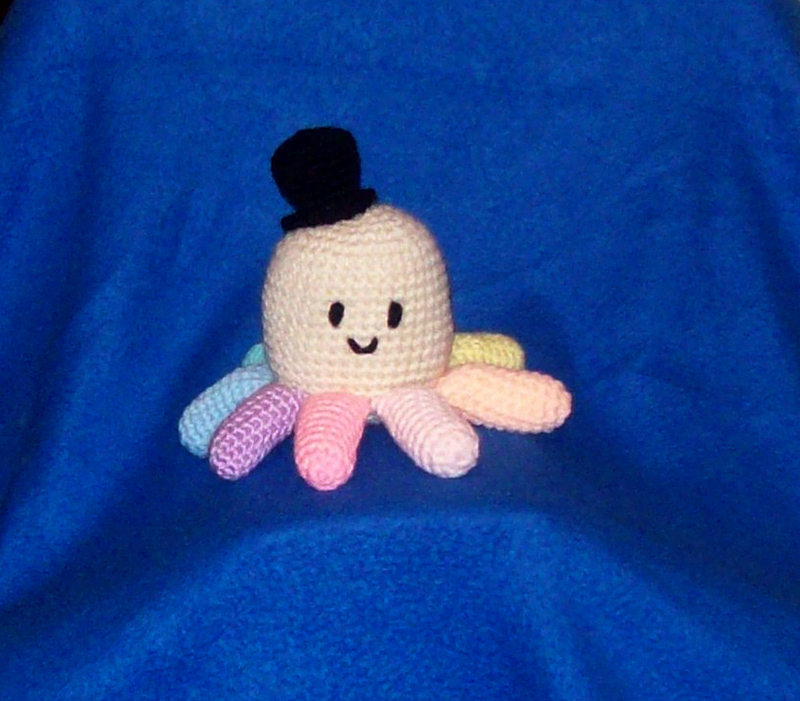 I finished and shipped a custom order so that a baby boy will have an octopus friend to greet him when he makes his way into the world later this year. I’ve experimented with crocheting with thread, which is something my grandmother did, though I’m not exactly doing it her way. 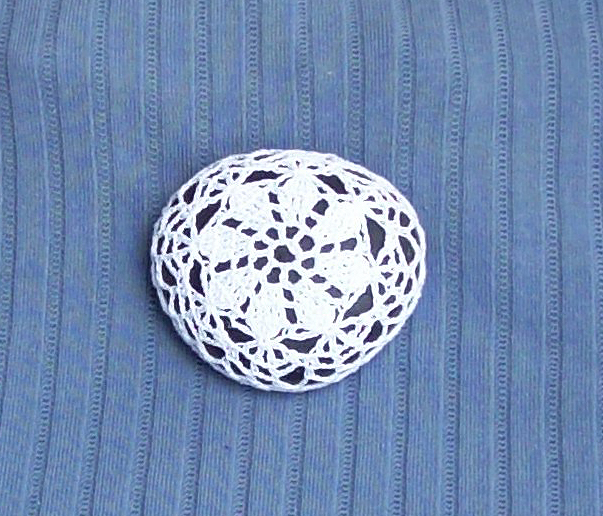 I don’t remember her crocheting around stones and using them as paperweights. I’m currently working on a baby blanket for the shop, a few personal projects on the side, and doing my best to manage day to day. I still do some of my best thinking while mowing the yard. I guess I’ll have to find some other way to do my best thinking for a while once autumn gets here. Well… there’s always losing myself in my crochet! I still want this blog to be a place for discussing art. Visual art, fiber art, music, storytelling… that won’t change. You can see from the links on the right that my visual art is still available for purchase. Some things are absolutely staying the same here as I move forward. If you miss frequent posts, though, I suggest following my crochet tumblr. Here’s to the end of August, and hopefully a September that brings the completion of that post on storytelling. Art is a Broad Term, Craftypodes, I Have Yarn!